You may never come across this problem but if you ever come into this situation, it will be a lifesaver. If you ever come into the problem of incorporating Arabic text into Illustrator, this tip is just for you. Adobe Illustrator is a type of program that only best suits the need of the English language so trying to use texts that have different letters than those of the English language will only lead to failed attempts. Though one thing should be noted; there is an Arabic version of Adobe Illustrator titled Adobe Illustrator Middle Eastern. This, of course, supports typing Arabic text correctly. This would imply purchasing it which is a waste since presumably you are using Illustrator already. First let’s make sure that you have an Arabic language support for your PC or Mac. Add the Arabic language if you must. Make sure that you select the right language before you start typing into a program. Make you sure you also select the right font before typing such as Arabic Typesetting or Adobe Arabic. Now if you try typing Arabic into Illustrator without any support (plugins, etc. ), you will get something similar like this. We have two problems with how Adobe Illustrator handles Arabic text. One problem is that Adobe Illustrator will normally type from left to right but this is a problem since Arabic is read and written from right to left. The second problem is that letters don’t connect at all which is a really big problem since there are rules of how certain letters of the Arabic language connect all of which depends of where they placed (beginning, middle, or end). Take for example the Arabic letters ف, ا , د , and ي which are “da”(d), “alif” (a), “fa” (f), and “ya” (i or e) respectively. Now if I want to write my name, I have to abide rules when connecting letters. There is “f” sound in the begging so I’ll write ف in the begging. An “a” comes after so I’ll connect the “f” and “a,” فا. A “d” sound comes next but “alif” (a) can’t connect any letters after it so I’ll leave the “d” unconnected, فاد . Now an “ee” sounds comes at the end but “da” doesn’t connect with any letters after so I’ll write “ya” separate, فادي . The left one is how adobe Illustrator will write it. The right one is the correct way to write my name. We will see how to bring correctly formatted Arabic text into Illustrator. Again the two problems are that Illustrator will write Arabic text from left to right and won’t connect the letters as you can see below. Now I present two solutions to the problem. 1.) Install the ScribeDoor plugin for Illustrator. Now this maybe costly but $89 (if purchased for Illustrator) / $119 9if purchased for Creative Suite) will be cheap in comparison to the Middle Eastern version. It’s also a good alternative since you manage the kerning and many other things inside Illustrator. You can also download a 7-day free trail if you want to try it out. Note: When installed, you can access the ScribeDoor plugin by going to Window>ScribeDoor. You may need to adjust the ScribeDoor settings inside the ScribeDoor window if Arabic text still don’t connect or type in the right direction. 2.) Install Inkscape for free. Inkscape is another vector program like Illustrator but it’s free. One good thing about this program is that it supports other languages so you can type Arabic letters just fine in Inkscape. Inkscape’s appearance is similar to Illustrator so it’s not too hard get acquainted with Inkscape. Select the type tool (has a symbol of an A) on Inkscape and click on your canvas to start typing. So let’s test Inkscape if it can correctly write the Arabic word for door (Bab) or باب correctly. Now it’s important what you do here. DO NOT simply highlight the text and copy and then paste it into Illustrator because Illustrator won’t recognize what you pasted and will react with crossed boxes as you see below. The correct way is to select the text you wrote and right-click and copy it. Now paste it into Illustrator and you get outlines instead of text. Now this may upset some but I don’t mind it since you alter the kerning, tracking, or anything else in Inkscape if needed. I hope you’ve enjoyed this tip and learned something new. Posted on August 24, 2011, in Challenges, Experiment, Text, Tips, Updates and tagged Arabic, Inkscape, Language, Problem. Bookmark the permalink. 12 Comments. Thank you. Seriously, many thanks!! This is great. Truly a life saver. Thanks! I have one AI file came from the client in which font applied for the Arabic text is AXT Manal but when I copy the text from AI to ME version of AI then the texts are coming out as box/unrecognized character. Please help. 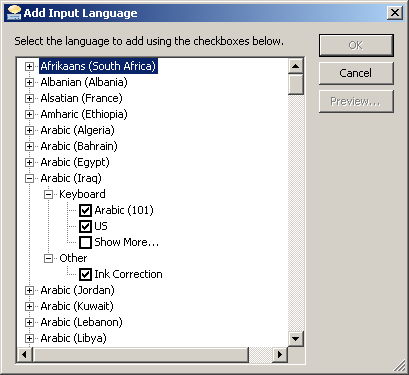 I also discovered you can type your Arabic in Word, choosing an Arabic font, and then save the Word document as a PDF. Then open the PDF in Illustrator. Hi Fadi, I have a problem with my illustrator CS 5.5 whenever I used arabic language from Scribedoor. The technical support of Scribedoor does not assist my region, I wonder if you can help. Thanks. Hello Josh. As mentioned in the post, you have to mess around with the scribedoor settings to get things to work right. But do shoot me an email (fadii925@gmail.com) explaining what kind of problems you’re having with scribedoor so I can know what you’re having trouble with. Find a font that supports Arabic text. Try a font like Adobe Arabic which should be included with Illustrator.